Rallarvegen is a famous cycling route along an old rail service track about halfway between Oslo and Bergen in Norway. You can rent bikes from the rail company, and they’ll take the bikes off you at the other end. The most popular route is to head from Finse down to Flåm, but we spent a couple of nights in Flåm before starting the trip, so we decided to take the alternative route to Voss. 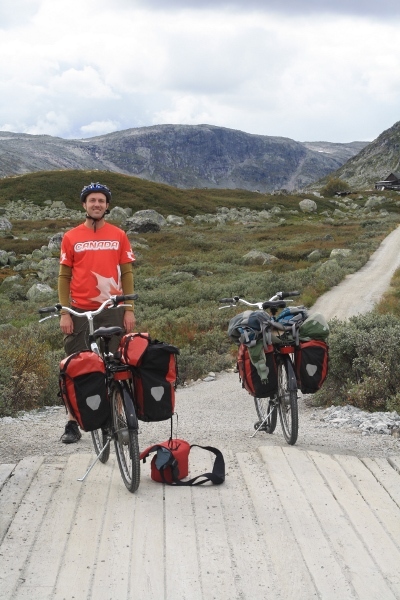 Bikes can be hired from the train stations at either Haugastøl or 27km further on at Finse. 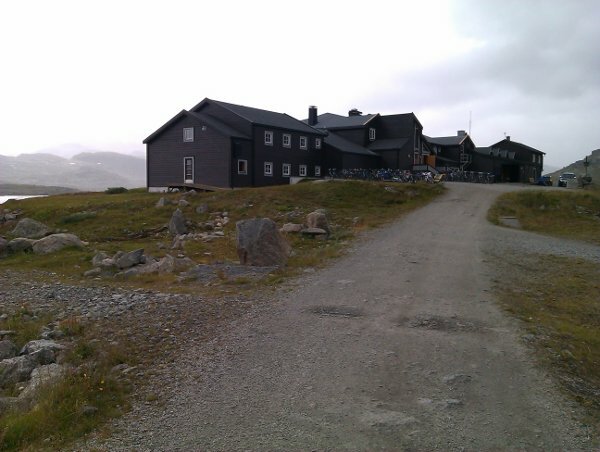 We chose to start at Haugastøl and stay overnight at Finse. It’s about a six hour train trip from Oslo so you have to stay overnight somewhere, and Finsehytta in Finse is the place to stay. The bikes they gave us were 8 speed commuters with fat tyres. Initially I laughed at the pedal brakes, but I was very thankful for them later on the steep and rough downhills (for which a mountain bike with hydraulic brakes would be preferable) and when the hand brakes began to get soft after a couple of days. You can hire mountain bikes for a higher price. They are probably the better option, but the commuters handled the trip surprisingly well. The ride to Finse is mostly a gentle uphill through tundra. It was overcast and quite cool, but there’s a cafe along the way to warm yourself over waffles and hot chocolate. At this elevation it’s often quite cold. The season only lasts from mid July to September, as it’s snowed under the rest of the time. Even though it’s well and truly below the arctic circle it’s apparently an arctic climate, so be prepared for chilly weather. Me with the bikes on Rallarvegen, not far from Finse. Finse itself has a couple of accommodation options. There’s the very expensive hotel Finse 1222, or the much less expensive but not really cheap camping hut where we stayed, Finsehytta. You can’t book at Finsehytta, but they don’t turn people away. By the time we arrived all the beds were taken and they offered us a mattress on the floor for about 150 NOK. You can’t cook your own food, but the three course meal they provide, although expensive, is amazing. The bar sells beer from a local brewery and is quite busy, and it’s only when it quietens down that they move the chairs and tables and set up the mattresses. Millerine was suffering the tail end of quite a bad fever, so not being able to get to bed early was a bit of a problem. I spoke to a bunch of older women at dinner who did the ride every year. The previous year they had only found sleeping space on the stairs, so, thinking themselves too old for that sort of thing, had finally given in and this year were staying at the comfortable hotel. The hut was still the place to go for dinner though. Finsehytta, the full service “hut” where we stayed in Finse. Estonia was where I did my first bike trip. In July 2006 I rode from my place in Viimsi to Paldiski with a couple of friends from Australia. We attempted to follow the number 1 cycling route but had no map and found signage a bit lacking, so we ended up riding on the uncomfortably narrow and busy highway for a good part of the trip. Since then signing has improved and there are more maps and information available. Other trips I’ve done with Millerine are Rakvere to Viimsi and Tartu to Viljandi. 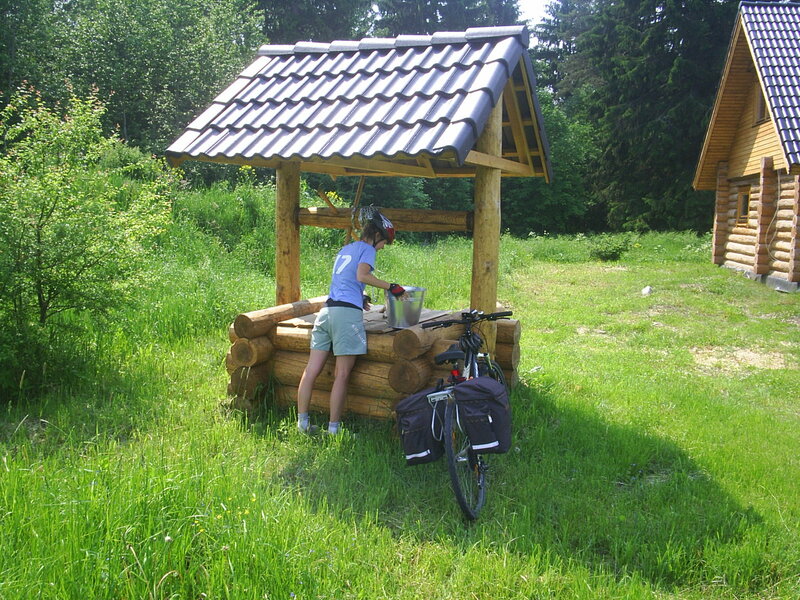 In general, Estonia is a great place for cycling in summer. There are quiet roads, regular villages and towns, and most importantly it is very flat. The highest point in Estonia (and all of the Baltics) is Suur Munamägi at a mear 318 metres high. There are about a dozen official sign posted bike routes throughout Estonia. The number 1 bike route is part of the number 10 Euro Velo route which circuits the nordic countries. The Esto Velo website contains a good amount of info in English. I purchased rough maps of the bike routes from a bookshop and they have come in handy when a sign post had gone astray. These days the routes are clearly marked on the Open Street Maps Cycle Map, which can be downloaded with a bunch of different apps on smartphones. There were a few days spare in our calendars and the weather looked fine so we decided to go on a bike trip. Rakvere sounded like a nice place to visit, so we packed our panniers, grabbed our bikes, and arrived in Rakvere by train in the afternoon. 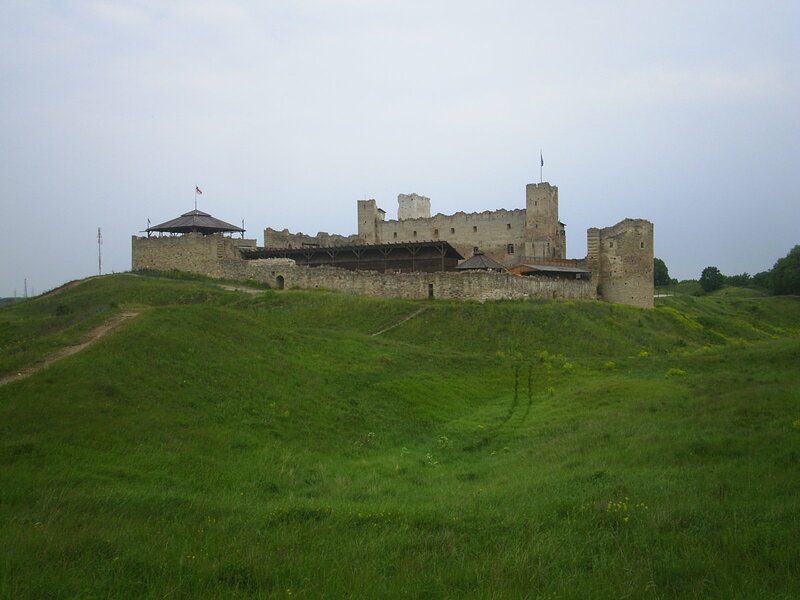 Rakvere is a nice Estonian town with the usual wooden houses and one of my favourite castles. It is partially ruined, and is set against a foreground of green grass over small hills and a moat. I found myself wishing I owned a holiday house in the town. We stayed in a nice guest house in town. I’ve no idea how we found it, but I can recommend that friendly and cheap style of accommodation. The plan was to follow the number 4 bike route towards the coast and then the number 1 route back to Tallinn. 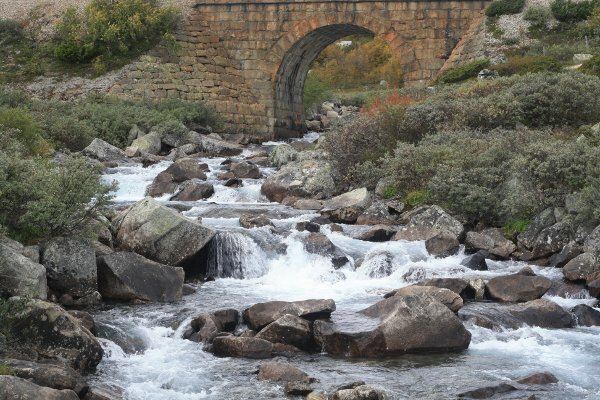 This is not a particularly direct route, but certainly a scenic one. The number 4 route is signposted the entire way, although at one point a sign had gone missing and we went a few kilometres before realising we’d missed a turn. We passed through quite a lot of wheat farming land in the morning before we reached the coast. It rained quite heavily at lunchtime, but luckily we were under cover at the Altja Kõrts (something similar to a pub) until the rain petered out. Otherwise Altja was a lovely seaside town with old log fishing cabins. The road winds along the coast. It was quiet, flat, and scenic. Basically everything one could want in a lazy day of cycling. We stayed in a campground outside of Võsu, a few metres from a creek (Võsu jõgi). There were no toilets, but otherwise it was nicely set up with an under cover area with a table, and a metal bbq type enclosed fireplace. These both came in handy, as again it rained but while we were under cover. 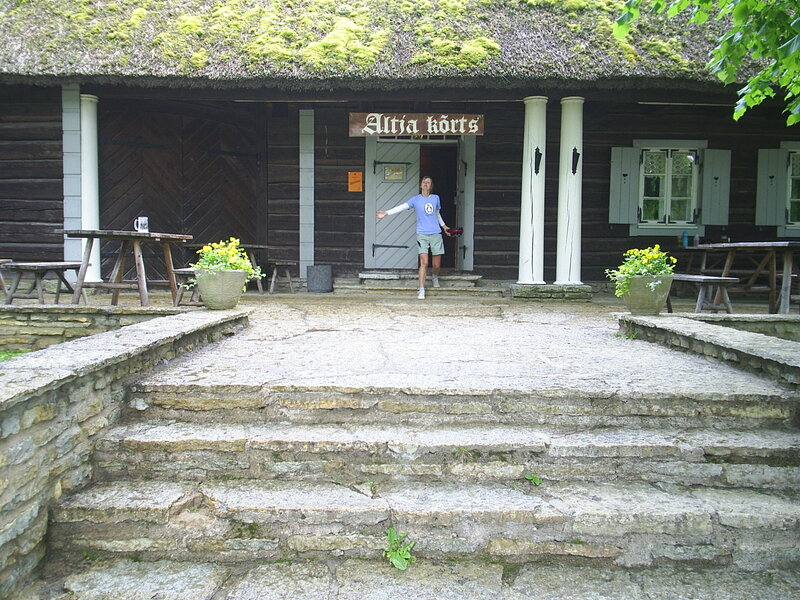 Campgrounds in Estonia are free and comfortable, but they can be hard to find so it’s worth doing some research first. We found this campsite on the RMK website, which is difficult to navigate, but has good information for the state forests. It would have taken a couple of days of cycling to get back to Tallinn if we followed the bike route around the coastal peninsulas. As the weather seemed destined to provide more rain we decided to fast track it home via the highway. On the way we visited a small waterfall, but it was mostly a direct fast and flat ride home. In terms of distance it was the longest day off riding we’ve done, so a satisfying end to a nice few days away.